A septic system inspection is one of those home maintenance tasks that you might put off, and then put off some more. Because septics exist underground in the backyard, they are often out of sight, thus out of mind. But letting it go too many flushes without an inspection can result in some major problems if the system fails. Plus, septic system inspections are also required if you plan to sell your home. Even if you don’t know if you’re going to sell, keeping your septic system in good condition will save you thousands of dollars in repairs if anything does go wrong. 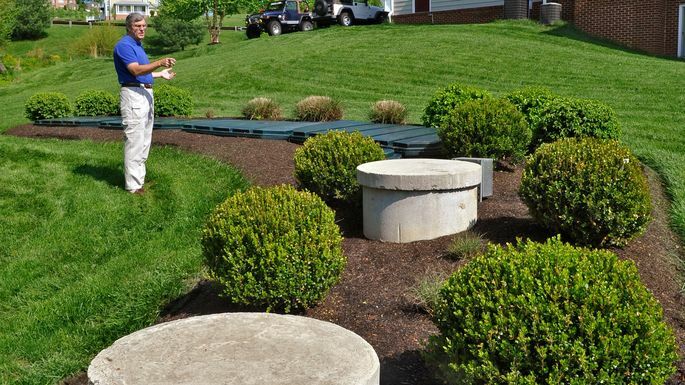 Here’s everything homeowners need to know about a septic system inspection. How often should you get a septic system inspection? Experts say you should get a septic system inspection every three years. But here’s a dose of reality: Most homeowners never get their septic systems inspected unless there is a notable issue, according toAlex Glaser, a real estate agent in Richmond, VA. But that means homeowners get an inspection only when issues that may signal big trouble arise, such as when the toilet backs up, water takes too long to drain, or there’s an actual septic system leakage. The benefit of doing an inspection every three years is to avoid major problems like these. The three-year mark is also the maximum amount of time you should let your septic system go without being pumped out. A problem caught at inspection can save you from having to replace the entire septic system (read: shell out a ton of money). It’s especially important to keep your septic system in good shape if you plan on selling. During closing, a certified inspection will be performed and you don’t want any last-minute surprises. Who should perform a septic system inspection? You’re going to want to hire a professional septic contractor for the inspection. General home inspectors do only a limited, visual-only inspection of the septic system, says Robert Boudreau of Metro-West Appraisal and Home Inspections in Detroit. A septic contractor will look for cracks in the tank indicated by a low level of liquid, the amount of solids inside the tank using a measuring device called a “sludge judge,” and possible ground contamination. How much does a septic system inspection cost? Cost depends on how extensive the septic inspection is as well as the size of the tank, which is usually either 1,000 or 1,500 gallons. But a basic septic system inspection typically runs between $300 to $600, says Boudreau. You can also reach out to your local health department to see if it performs inspections for a reduced price. Is the home seller or buyer obligated to get an inspection? The person who’s responsible for carrying out the inspection is determined based on where you live. In states such as South Carolina and Texas, it’s the buyers’ responsibility to handle inspections during their option period—part of their due diligence—unless otherwise agreed upon. In Central Virginia, the standard purchase agreement contract states that it’s the home seller’s responsibility to get the septic inspected within 30 days of the closing date. If you live in a state with this type of timing caveat, don’t do an inspection before an accepted contract or you may have to do it all over again to meet the contract timeline. Bottom line: Ask your local real estate professional about your obligation regarding the septic system inspection. Is the seller obligated to fix any septic problems? The responsibility to pay for septic repairs typically falls to the seller. However, repairs of any kind found at inspection are generally negotiable. Contract terms usually dictate the course of action, but sellers may have such options as doing the repairs themselves, splitting repair costs with the buyer, giving the buyer a closing credit equal to the amount of the repairs, or refusing to do anything. If an agreement on repairs isn’t reached, the buyer does have the legal right to walk away from the transaction. In all states, sellers are required to disclose any known problems with a home to potential buyers. If there’s a septic issue after closing that the sellers knew about, they will be liable for the entire cost of the repairs. For that reason, it’s good practice for all sellers to perform their own septic system inspection, says Jerry Grodesky, managing broker at Farm and Lake Houses Real Estate, in Loda, IL. “That way, the seller is protected from any future septic issues after the closing,” he explains.